A district/borough councillor since 2006, County Councillor since 2009, sitting on planning committees for North East Derbyshire District Council and Derbyshire County Council (2009-10), previously an archaeologist with nearly 20 years field experience, including in the Peak District. I hold a first degree in Environment and Archaeology, gained at University of Wales, Lampeter and a Masters degree in Archaeology and Heritage Management from the University of Leicester. I have researched and written on a range of topics including landscape archaeology and rock-art, with a particular emphasis on prehistory, including a book titled ‘Hunting in Britain: from the Ice Age to the Present’ published by History Press in 2009. In recent years my wife and I have become holiday cottage owners and wine producers with vineyards on the edge of the Peak Park, in Wessington, Ashover and Brackenfield parishes. I was, until being elected Leader of Derbyshire County Council, the Chief Executive of the United Kingdom Vineyards Association, leading it through key changes as the organisation became Wines of Great Britain, which is the growers association and marketing body for the English wine industry. I have been a Local Government Association Culture, Tourism and Sport Board Member since 2014, a national body with strong links to the cultural and tourist economy of the UK and the role local authorities play in supporting these sectors. 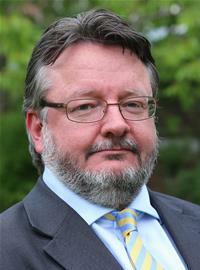 Since May 2017, I have been the Leader of the County Council, Chairman of the Derwent Valley Mills World Heritage Site, LEP board member and founder and Vice Chairman of the Culture, Heritage and Tourism Board, bringing key partners together to work for the benefit of Derbyshire’s tourist and cultural economy by driving projects and growth. National Parks are protected for the nation forever but are also places that people, live, work and play; as well as being a space we share with nature. These could be competing interests but I hope through effective policies and working, good decisions and governance that these elements can be managed to benefit all. Primarily the Peak Park is and always has been a living, working landscape that is reflected in a rich palimpsest of ancient monuments, traces of human habitation and workings that come right through to recent eras. How we manage the National Park now will contribute to that landscape story for the future.